A few days after publishing last week’s bourbon slide show, it hit me that I had forgotten to include my favorite “slide” of the trip. While the photo subject was neither food nor drink, it seemed to capture the spirit of the bourbon-making process. The black building above is a rickhouse–essentially a non-climate controlled multistory building where bourbon is aged–owned by Barton Distillery in Bardstown, Kentucky. 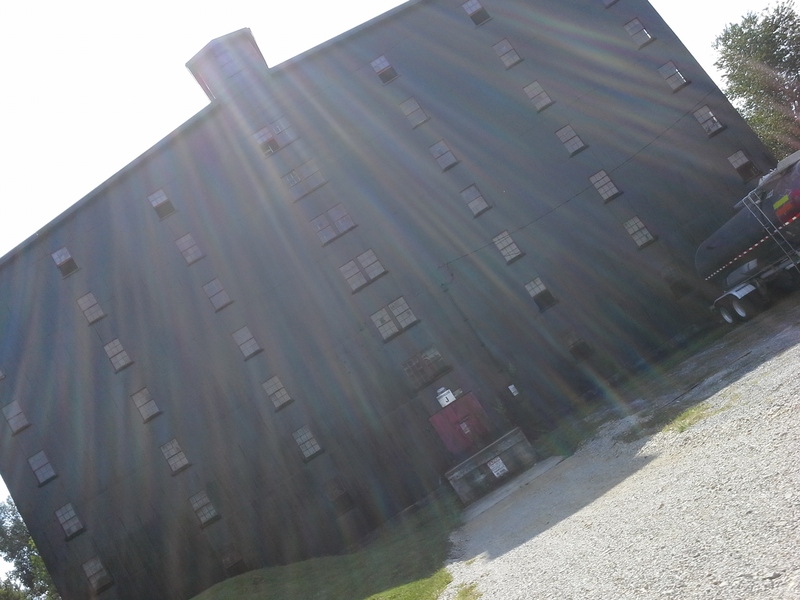 The light streaming down from above made me think that the manufacture of bourbon was being blessed. And while I’m sure there are those who would not see spirit-manufacture as heavenly, there is the matter of the angel’s share. About two percent of the bourbon in a barrel is said to be lost to the angels each year, and this photo might just be proof. Silliness aside (or is it? ), I’ll send you over to a recent Blog of Funny Names post to talk more about bourbon. Then please come back again next week as we’ll get back into the kitchen. Bourbon brittle anyone? You know you have me back with bourbon brittle!!! I better get crackin’ then 😉 Thanks, Mimi! Bourbon brittle?!?!?! I’ll take that as my share, to heck with the angels! that’s awesome, Kerry. Love your attitude here. Not going to share, huh? 😉 Don’t blame you. Bourbon brittle I like how that sounds. I love the photo, it does look rather heavenly with the streams of light and the building itself is very cool looking. Great photo. Thanks, Suzanne. Pressure is on to come up with a decent bourbon brittle now! Glad to have you here. served with a French blue cocktail? Bourbon brittle. Yes. Let’s make that happen. Are there??? That’s just depressing! She is SO important. I mean, she literally is who we experience the DW universe through. Love that article. It hits on so many great points. Great photo! The angels must have really been partying it up that day. 😉 Looking forward to the bourbon brittle – yum! lol, that’s right HD. Was glad to have caught them in action. From your blog to God’s lips, Liz. I bet they have the coolest shot glasses up there! Those bourbonized beams seem to be two-directional to me, my friend. Great photo. I am sure the angel’s shot glasses are very sparkly. Yep, two-way sunbeams, The whole thing just made me shiver with delight. Really did feel like we were being blessed 🙂 Thank you much, Mr. Mark. was curious if you’d seen the movie Angel’s Share? yes, do. It’s more of a guy movie than a chick flick, though I loved the whiskey connection and it cracked me up. Let me know if you find (can stream it netflix) and what you think. Tried to catch it in a theater, but wasn’t out long. Very much an indie. Nice take on that picture! No wonder the angels are singing. Hallelujah chorus, yes? If this isn’t an advertisement for Heaven, I don’t know what is. Partying with the angels seems a way better idea than that other option. Great photo! Let the bourbon fun continue! Thanks, Gretchen. Can I hear a woohoo? 😉 All sorts of bourbon fun, but have yet to drink any since we returned. Real life leaves no time for cocktails 😦 Though a girl can always dream, right? Don’t I know it! Real life isn’t as fun as my daydreams! Life will get hectic here soon when swim lessons begin again, dinner at the gym for us twice a week. 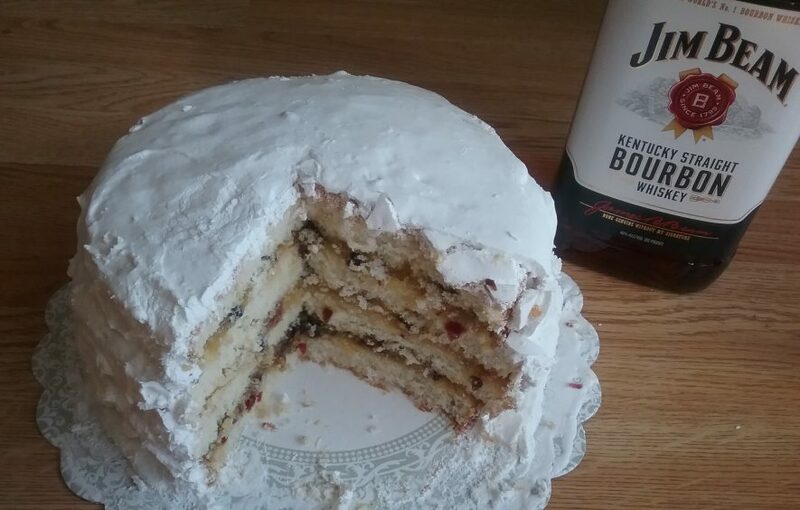 bourbon brittle does have a lovely ring to it, Bonnie. Perhaps I should get you in on it and we can call it Bonnie’s Bourbon Brittle? Huh? Bourbon brittle. Please. For halloween. Please. be sure to come by for a trick-or-treat 😉 Thanks, CCU! Yes I want some Bourbon Brittle 😛 YUM!! Now I’m tied into making this happen, Amy! Yikes. Now I know what I’ll be doing this weekend. If you lived nearby, I would invite you over to eat through all of my mistakes (and the winner, too 🙂 ). A cool lovely post, Liz! thank you, Sophie. I’m going to be all about bourbon for a while–just warning you. Thanks, J. Coolest booze term ever, I think. And you would love the movie, I’d bet. Check it out via netflix streaming if you have. How timely is this post!?! On my recent outing, I noticed the number of micro-whiskey distilleries is on the rise. Saw several in Montana. We even have on in our own little town.